As promised we are giving our best to keep you updated and to let you in on our development and progress more frequently. Therefore, we would like to use this rather small update to tell you what happened, what we are now doing and what we will do next. ASCENDANCE has been launched successfully and is currently helping us to stabilize our whole situation and to gather new experience on other frontiers. We already have received quite some very interesting feedback - some very positive and a couple of not too positive responses which mainly criticize the gameplay and technical aspects rather than the art style. This and future feedback will be very helpful for overhauling and finishing ESSENCE. By listening to the feedback that engaged people giving us we will be able to make ESSENCE better and more enjoyable for everyone. We also hope that you had fun playing ASCENDANCE and that you enjoyed this different but maybe even familiar game. As announced with the last update our focus is now on DYSTOA, which of course every baker of ESSENCE will receive once the game is finish. We are on a good schedule so far and are very confident that you will be able to play DYSTOA completely finished in June this year. But we have to get the word out about DYSTOA, bringing up more engagement in a time where interest fades away quite fast. 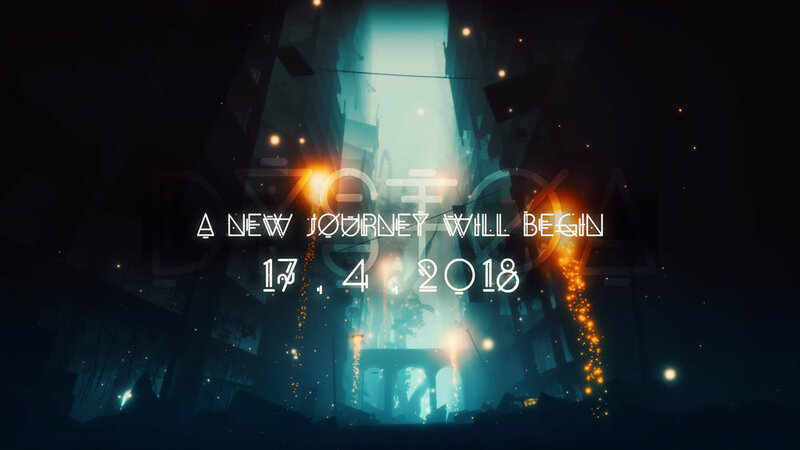 And to further support the development of the game with some additional assets and refinement and to give the game a stronger start boost, we have decided to launch a small Kickstarter campaign for DYSTOA next week on Tuesday, the 17th of April. For this campaign, we took into account that we are on a tight schedule here and that we do not want to let you wait any longer than necessary. Also, don't worry this will not be a huge and broad campaign as ESSENCE, but a rather small and lowkey designed one, to give us a small financial boost to finish up DYSTOA on schedule and avoiding additional risks. Therefore, we have designed the pledges and stretch goals of this campaign in a minimalistic way. Of course, we are aware that a second campaign might be uncomfortable to hear, we thought a lot about it and so we do our best to treat this campaign always as the side project. On the other hand, it will be nice to gather some new travelers on our common journey and to also look how the general interest for this game will be. As mentioned before, every baker of ESSENCE will get a copy of DYSTOA. And the Backers of both ESSENCE campaigns will get a very special place in this game. Anyhow, we are of course very happy about every support we can get and would like to encourage you to tell your friends about the game, those who might wanted to support games like ESSENCE and didn't have the chance yet, or would maybe love the darker style of DYSTOA. We really hope that we are not pushing too much on you with this situation, but we just have this strong feeling that we have to finish DYSTOA before tackling ESSENCE anew in the summer of 2018. There is something about we have to bring out, to prove ourselves capable for delivering not only a game but a finished and pure experience, to be bold and visionary and to reignite our hope and will with fiery creativity! ... and trust... in the path leading to this unknown horizon. As always we want to hear your feelings and thoughts about it. Are you okay with our current path? What can we still do better? And what should we talk about next? A long time has gone away again and we wanted to give you not only another sign of life but also show you what we've been working all this time. Some months after the Early Access launch of ESSENCE, nothing went as planned, and now the time has come for something to change. Something within ourselves to finally get into the state of an indie game developer, that we always strived for. Currently, ESSENCE is in a pause status, this might sound disappointing but don't worry, development will continue soon. After the launch of ESSENCE on Steam, the overall sales dropped quickly and we already suspected that when we just straight continue to work on this game we will run the risk of working on a loss and therefore finishing the game with dept or even go bankrupt before finishing. We still have the reserved resources for all the backer rewards of the campaign but we never want to use this for the development. So we had to come up with a new plan, we had to change and adapt. Shortly after the realization, we had decided to work on some smaller game related contracts to get a steady stream of revenue for continuing working on ESSENCE. In this way, we could also build up our small team, not with people, but knowledge, experience, and skill. This worked for a while but the problem was, we didn't get much time to work on ESSENCE. Furthermore, we had to finish our Studies and transitioned into full independent developers. After finishing our studies we have to face the new challenge to get back into ESSENCE. But the sales were still very low, most days we sold not even one copy. We had to face that ESSENCE was trapped in a typical game death spiral, any work on an update would risk to not bring any new players and momentum, and player interest cannot really be brought into without any new content to show of. But that should not stop us, we had an idea to solve this problem. A small surprise game we had also planned for you. A game that was destined to be reworked from our very first prototype level of ESSENCE, which was not fitting anymore for the real game. But it has now a twist to it. It's also a game reminiscent of our very beginning and filled with the soul and signature of the people who supported us from the first day and backed the first and second KS campaign. We present you DYSTOA. DYSTOA was supposed to be the extra gift game for the 200$ Tier and was already in preparation for some time. With our new change, however, we want to adjust this Tier, because this game has also grown a little bit in scope. It's still a rather small game compared to ESSENCE and more of a side project. We will now give this game to anyone who backed 20$ or more for free as a redemption for the rocky development of ESSENCE. And we are planning to release the game in Q2 of this year to further support our development of ESSENCE and to sustain as a small studio. But since we worked out the fundamentals of Dystoa and still could find why ESSENCE exactly sold so poorly or how we could rework ESSENCE we further tried through the iteration of DYSTOA and found the solution. ESSENCE has, of course, many other flaws we are aware of, but to keep it short: the core of ESSENCE was not well defined. The problem was that the game wanted to be so many things at once that it became a master of none. Especially the broad story and exploration parts, the huge scale and the platforming mechanics where conflicting for many players. So we decided to use not only DYSTOA to find the solution for the problems of ESSENCE but another game to put the problem to the test. And so we decided to make another game with all the new experience we collected over the time and it really showed off. But it should also be smaller and more focused experience and have an opposite approach. Where DYSTOA should be focused on exploration, this one would be around movement and platforming. We introduce to you ASCENDANCE. We have released it already and of course, it is free for all Kickstarter backers. The download link is in the next update/notification on Kickstarter. We will update you again when we are full work on DYSTOA and know better when the date of release will be and the huge update of ESSENCE can be expected. It's still unwritten how exactly we will change ESSENCE, but that's the excitement and mystery after all. We are also now looking forward to eventually finish the game completely by the end of 2018. This will be our year, full of surprise, redemption, and fulfillment. We hope you can now understand more where we are coming from and got a better picture of us and our motivation overall. This clear communication might have been the thing that was needed all the time. We hope that you still believe in us and are thankful for your patience. And there is still more to tell, so you will hear from us again, sooner or maybe later. We hope you like what we have worked on and that you have fun playing ASCENDANCE. And of course, tell us what you think of our change and what you like or not like. Thank you for reading through all of this and as always thanks for your patience, brave travelers.